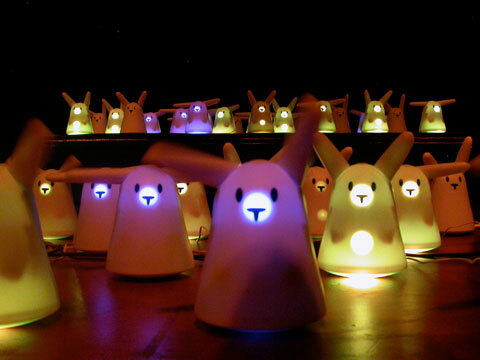 100 Nabaztag smart rabbits play together an opera specially composed by Antoine Schmitt et Jean-Jacques Birgé. Evoking John Cage, Steve Reich, Conlon Nancarrow and György Ligeti, this musical and choreographic score in three movements, transmitted via wi-fi, plays on the tension between the orchestral ensemble and the individual voices to create a strong and involved showpiece. This opera questions the issues of working together, organization, decision and control, which are increasingly central and difficult in our contemporary world. Schmitt and Birgé have chosen to twist the industrial object into an artwork in which the choreography of the ears, the play of light and the hundred small loudspeakers hidden in the stomachs of each rabbit create a composition with three voices built on time delay and repetition, programming and disrespect for rules. The sound comes out the belly of each rabbit !